Stay left! Now stay right! Kayak guide Vivian shouts for us to move to one side or the other of the Fa’aroa River. No boulders, tricky currents, or crocodiles are in evidence, so why is there a slight sense of panic in Vivian’s voice? Coconuts! In many places coconut trees overhang the River, and a coconut falling on your head can be fatal. A kayaking woman was killed in this very spot two years ago, and Vivian is determined there will not be a tourist death on his watch. 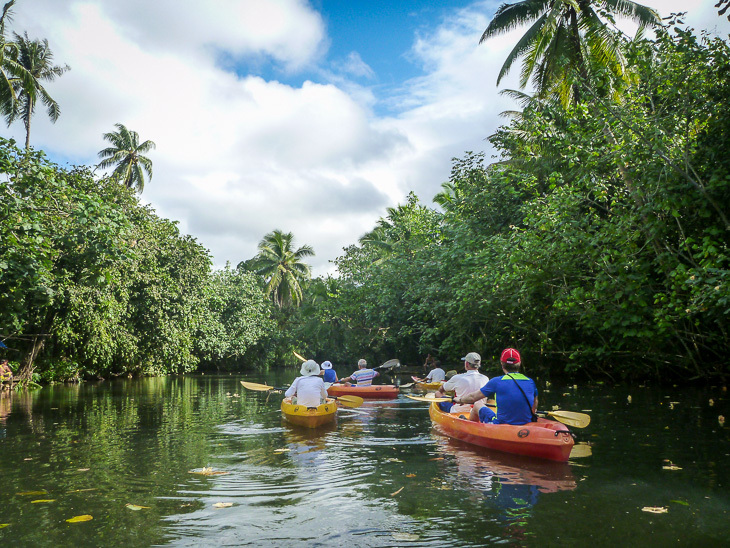 The Fa’aroa is Polynesia’s only navigable river, and it can only be explored by water, so of course we had to paddle there. 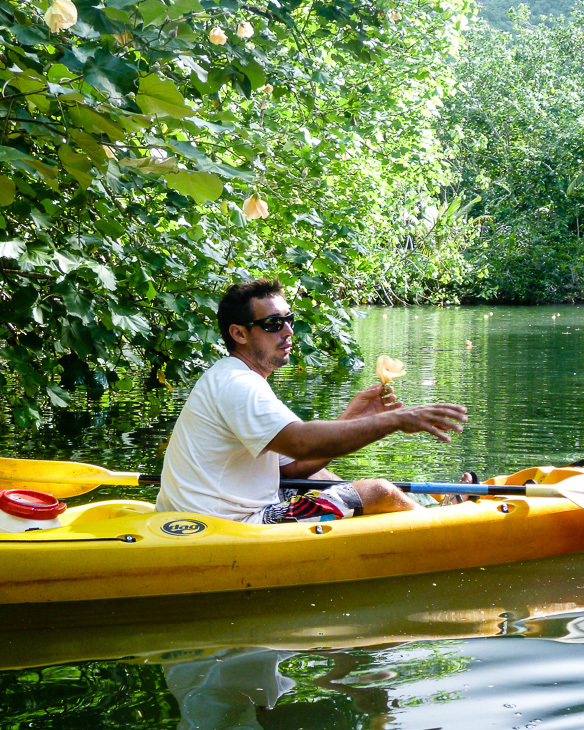 Our Cruise Director and five fellow passengers joined us for this back-to-nature kayak tour provided by Lagon Aventures. When he wasn’t watching out for coconuts, guide Vivian described the birds, flowers (wild hibiscus, wild ginger) and trees (bamboo, chestnut trees, banana, pandanus, mango). The river and its lush jungle foliage were the focus of this kayak trip, but we also had views of two steep mountains: Tefatua and Oropiro. When Luciano blows his conch three times, that’s the signal to hold on to the railing, because he’s taking the jet boat up to top speed: 50 miles per hour (80 kmph). 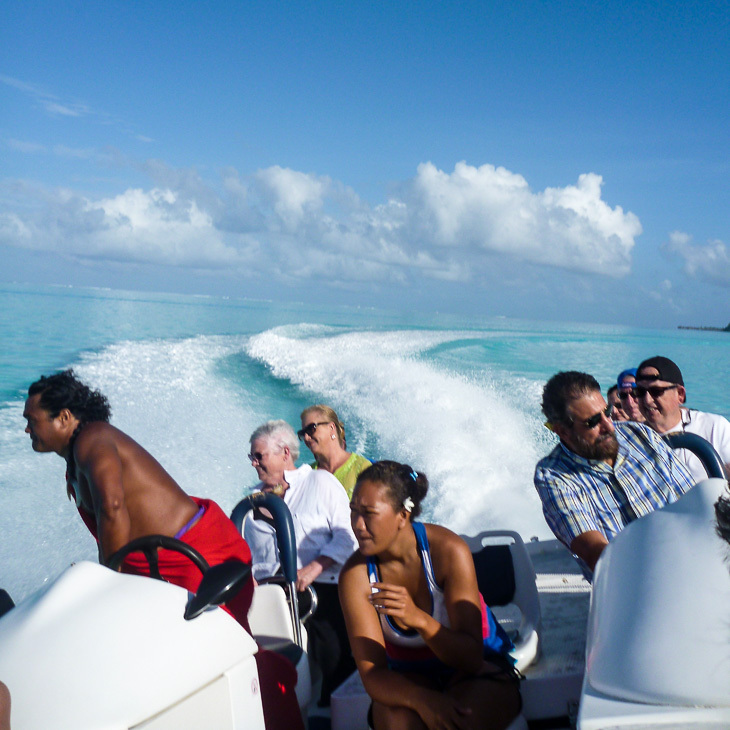 There are numerous ways to explore Bora Bora’s massive lagoon. Jet Boat and Snorkel Adventure sounded sensible; with a jet boat we could cruise the sparkling lagoon speedily in the morning, leaving the afternoon free for land-based exploration. Circumnavigating the island, we dropped anchor at Coral Garden, the best snorkeling spot, which teems with colourful and friendly tropical fish. After an hour of snorkeling, we headed on to a second stop in shallow water off a beach with sand as fine and white as powdered sugar. Off with the swimming suits and onto rented bicycles (with fat tires, coaster brakes, and no gears)! 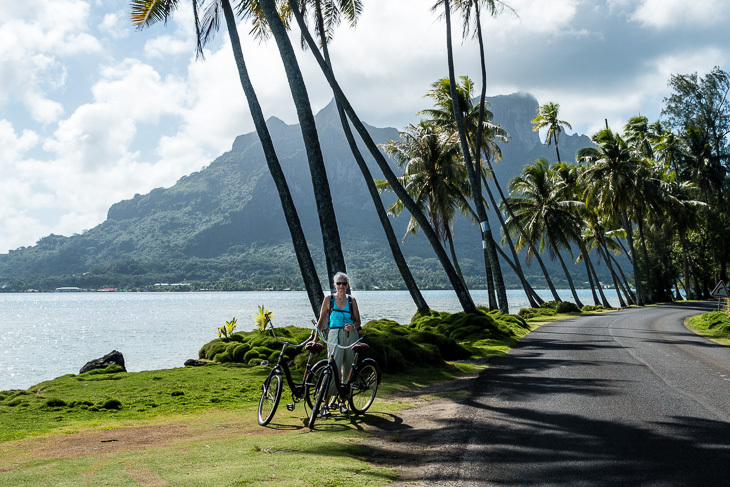 Bora Bora’s 32-kilometre coast road hugs the shoreline almost all the way around the island, and it’s an ideal half-day cycling trip. Great scenery, with the jagged peaks of an extinct volcano dominating the landscape. 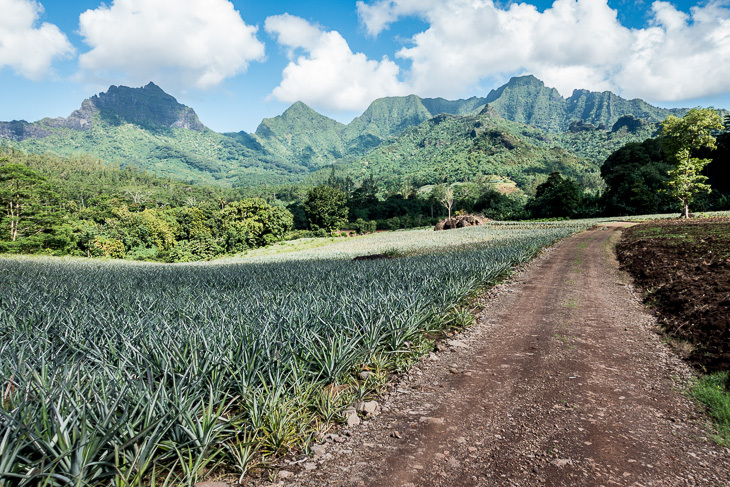 Traffic is light and respectful; pigs, slow-moving dogs, smiling Polynesian tots, coconuts, and pot holes were the only obstacles on this mostly-paved, mostly-flat road. 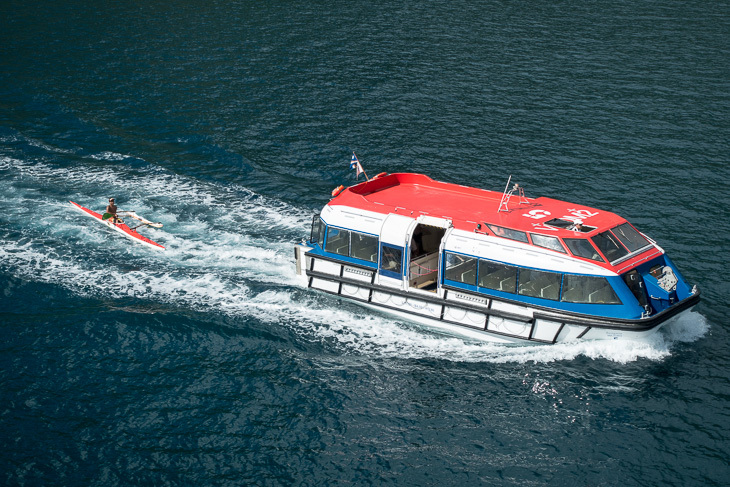 Thirty-two kilometres doesn’t sound like much, but we were sure glad to get back to the tender dock, where Oceania staff were handing out cold water and lemonade. It’s Boring Boring, not Bora Bora, we were told by a crew member who has done a lot of cruise business in this area. We certainly weren’t bored here, but we were on the world’s most romantic island for only one short day. This is it: the world’s most beautiful island. All hands were on deck, awestruck by the jagged peaks cloaked in lush greenery, as our ship dropped anchor in gorgeous Cook’s Bay. Passengers were still rubbing their eyes at the sheer beauty of this island as we were tendered to a makeshift village where locals were selling shell necklaces and other souvenirs. Hike the 3 Coconuts Trail, the ship’s shore excursion we had booked, was cancelled due to insufficient registration. This is the fifth such cancellation. It seems that cruisers are not fond of excursions described as “very strenuous and lengthy, over partly-shaded and uneven terrain, uphill and downhill with an elevation gain of 1171 feet.” Hiking without a guide is not recommended on these islands, so we opted for an Off-Road Safari, a scenic drive through Moorea’s deep valleys and mountains. At Belvedere Lookout we met a group of children who had travelled from Tahiti on a school trip. After singing two songs for us, each child wanted to ask us “how old are you” and “when is your birthday.” This was their first-ever opportunity to speak English with native English-speakers. Pineapple plantations, a sacred temple where men were sacrificed, an agricultural college, a fruit juice factory, and a steep climb to a lookout called Magic Mountain were other stops on this bumpy, four-wheel-drive tour. Raiatea: vanilla; Moorea: pineapple; Tahiti: beer. 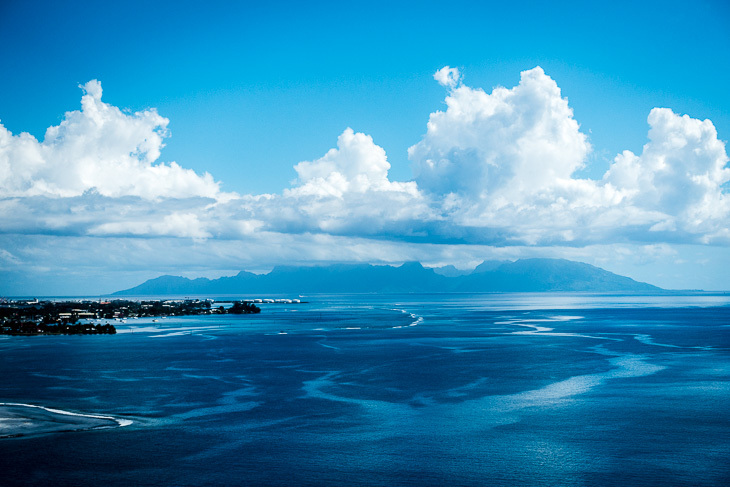 We had been warned that Papeete, Tahiti was a grimy and rough-around-the-edges place, but it’s not that bad. With 70 per cent of French Polynesia’s population, Papeete is a just a medium-sized town with traffic, construction, and some clutter. Cruise ships dock in the heart of Papeete, alongside a waterfront esplanade that makes a pleasant walk before or after getting out of town. 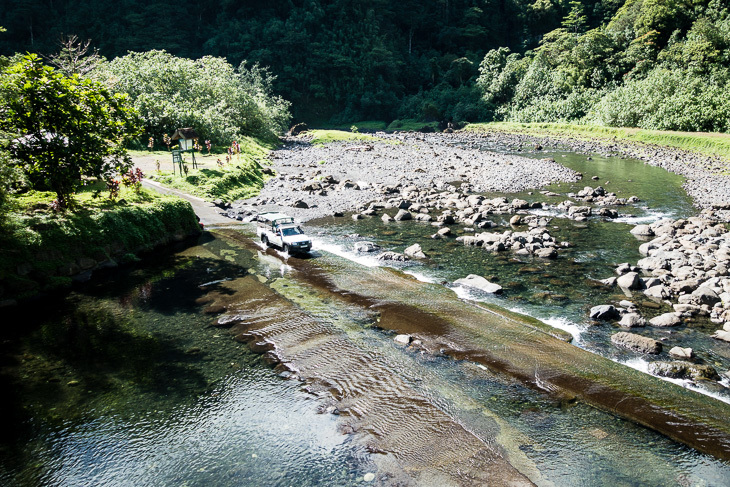 Off the Beaten Tracks 4×4 Adventure visits Tahiti’s most scenic area in an off-road, dusty fashion. Our route followed the wide Papenoo Valley, the only valley to cut right through the volcanic interior of the island. Archeological remains, waterfalls, and viewpoints were stops along the way. 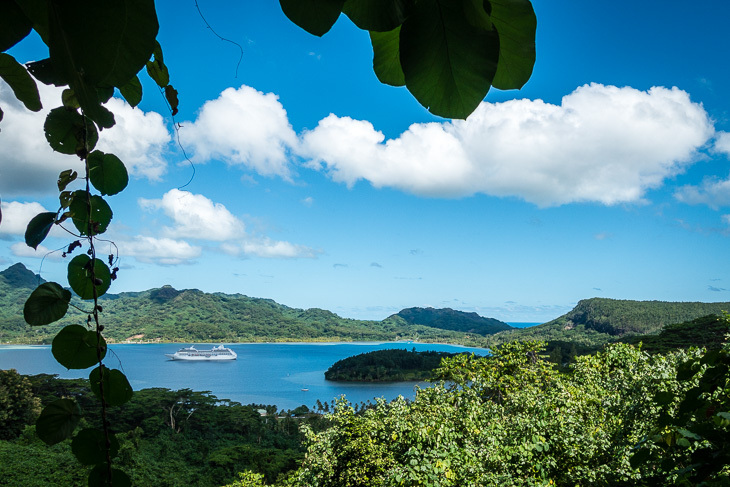 Sydney, our guide from Tahiti Safari Expedition, gave us a lot to think about. Sydney shows us what is native and what is not. We see a mimosa-like plant with thorns like a razor blade, and an invasive vine called kudzu that grows before your eyes. Botanists and others have made a few mistakes, introducing rats, vultures, and some plants that shouldn’t be here. Yes, human sacrifices and cannibalism took place at the temples, but it was part of the Polynesian warfare system (losers had their hearts removed to take away their power). Was it really so different from warfare in other parts of the world, where losers always suffer? Sydney says life can be tough here in paradise; the social support system is crumbling, and French Polynesia remains thirty years behind the more developed parts of the world. Paul asks us to take the romance and push it aside for a few hours. The Europeans did not destroy paradise (it never was a paradise), the Christian missionaries were not evil, and the number one industry is not tourism; it is aid from France. Does that sound like an anthropologist speaking? Paul, anthropologist and long-time local resident, is well-qualified to lead our four-hour walk-about tour called Sacred Sites and Cultural Walk. 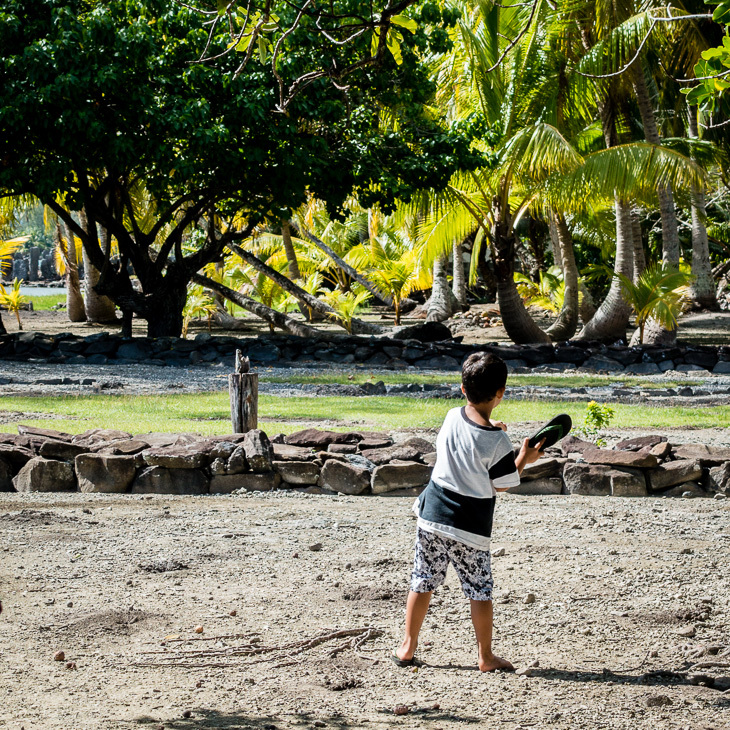 Rahui, Paul’s five-year-old son, joins us for part of the tour (the part where we get ice cream cones), but he seems happiest when he’s on the beach, using one of his flip-flops to bat pebbles. 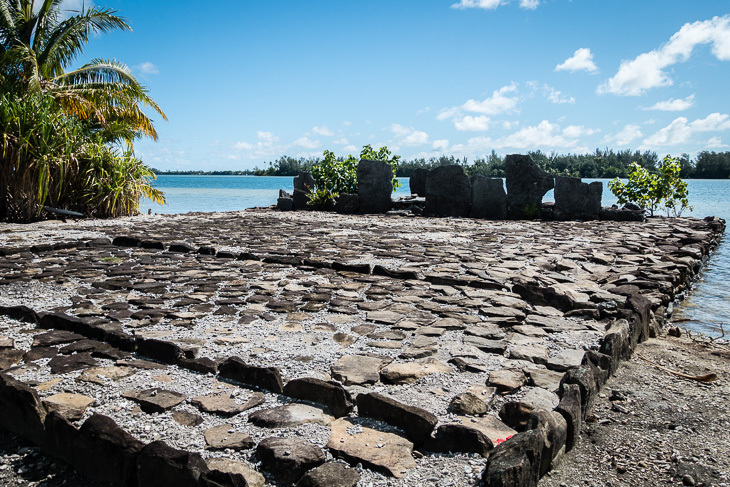 Maeva Village is home to the densest concentration of archeological sites in Polynesia. 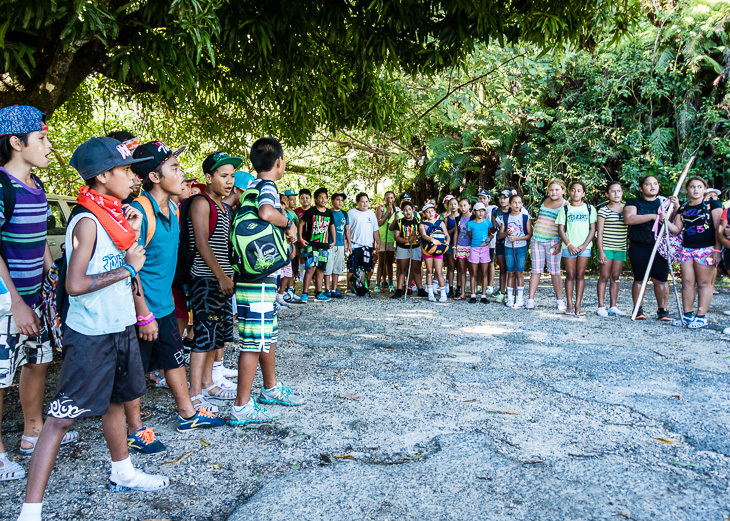 At one time, this shoreline site was the traditional home of all of the island’s chiefs and their families. A bush track leads from the coast to Mata’irea Hill, home to over 200 stone structures, including temples, agricultural terraces, house foundations, fortification walls, and burial platforms. “If you are looking for a party, head elsewhere,” advises Lonely Planet. Huahini scores high on physical beauty: lush, jungle-like scenery and blue lagoons. Eight villages are scattered across the island, but in between there’s just stunning scenery and solitude. If we had an atoll, we would name it “No Problem” (that’s No Problem Atoll, kids). An atoll is a low island, and Rangiroa (Rangi, as it’s known to its friends) is a big one – the world’s third largest. 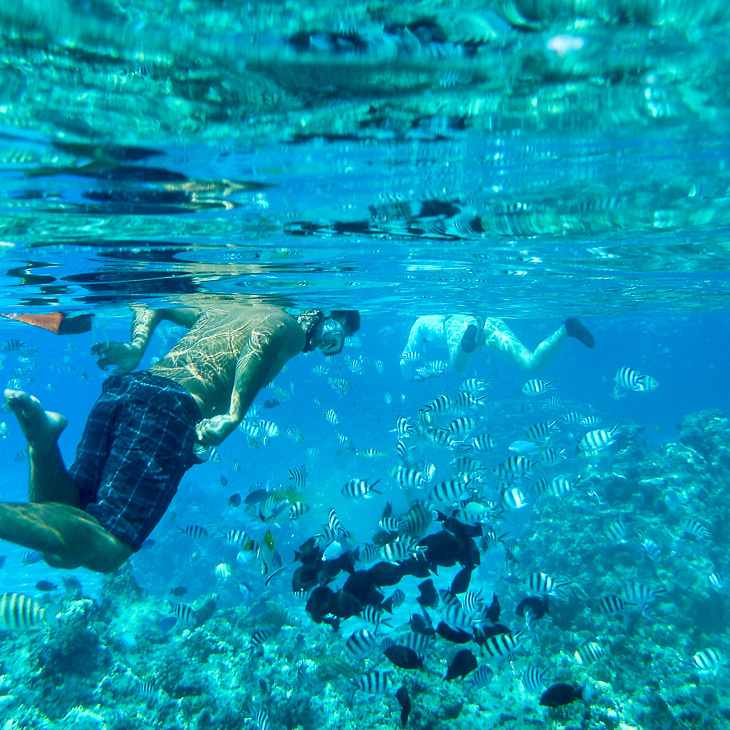 The snorkel-then-cycle routine worked well in Bora Bora, so we used that same combination here on Rangi. 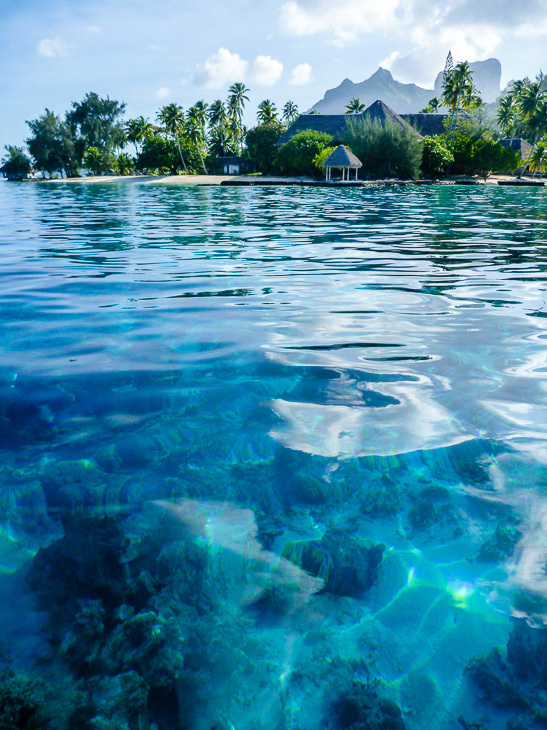 Rangiroa is a natural, open-water aquarium. 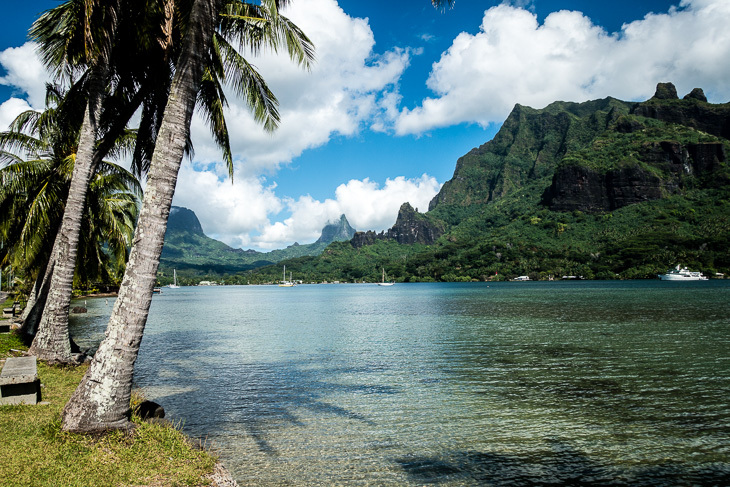 Divers come for the intimidating and world-renowned drift dives, but snorkelers like us head to a safer spot called Motu Nui Nui. Sharks are the main attraction, and we saw lots, but they were the friendly varieties. 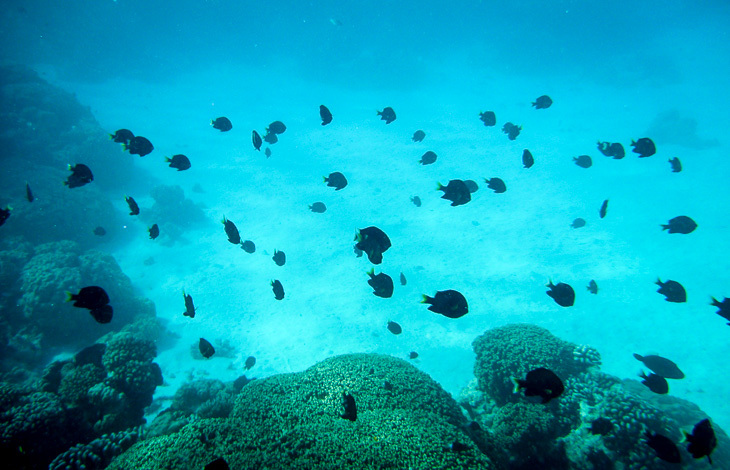 Eels, colourful fish, and coral were also observed. A twelve-kilometre road runs from one end of Rangiroa to the other. Snack Puna, a restaurant by the tender pier, rented us two bicycles. After locating a pump and pumping up the tires (which were completely flat), we headed off on our out-and-back trip. A pearl farm, two churches, a cemetery, and several snack bars were the sites along the way. On a small nearby islet, there’s a vineyard that produces the world’s only coral wine. 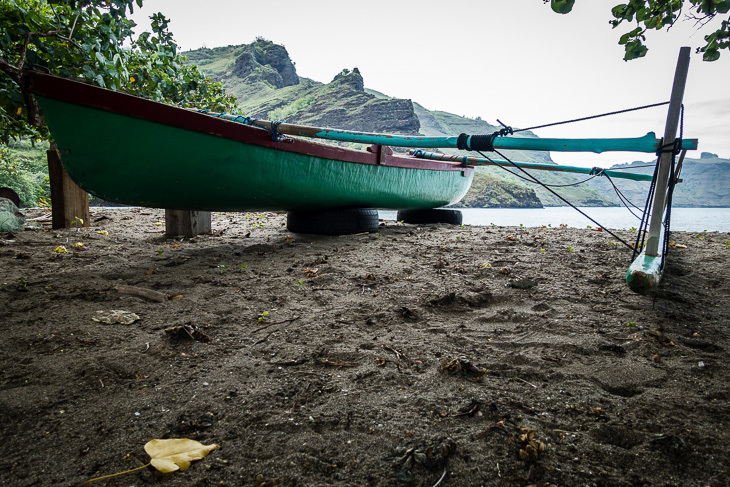 Every personal vehicle on Nuku Hiva was waiting for us at the tender pier. Four passengers per vehicle, we travelled in a convoy on a panoramic sightseeing tour of this huge and sparsely-populated island. The drivers did not speak English, but one English-speaking guide was available for our convoy of thirty cars. Taipivai Valley has two connections to the USA: Herman Melville and the Survivor TV show. American writer and former sailor Herman Melville deserted his ship and hid in this valley. Captured by natives, he lived in the valley for three weeks, during which time he observed their way of life. This experience was the inspiration for his novel, Typee. More recently the site was made famous by being the base camp for the Survivor Marquesas TV show filmed here in 2001. Taiohae, the “capital” of the Marquesas Islands, is stretched out along a crescent-shaped bay at the base of soaring mountains. There’s a downtown cathedral built from wood and stones on a former sacred site. 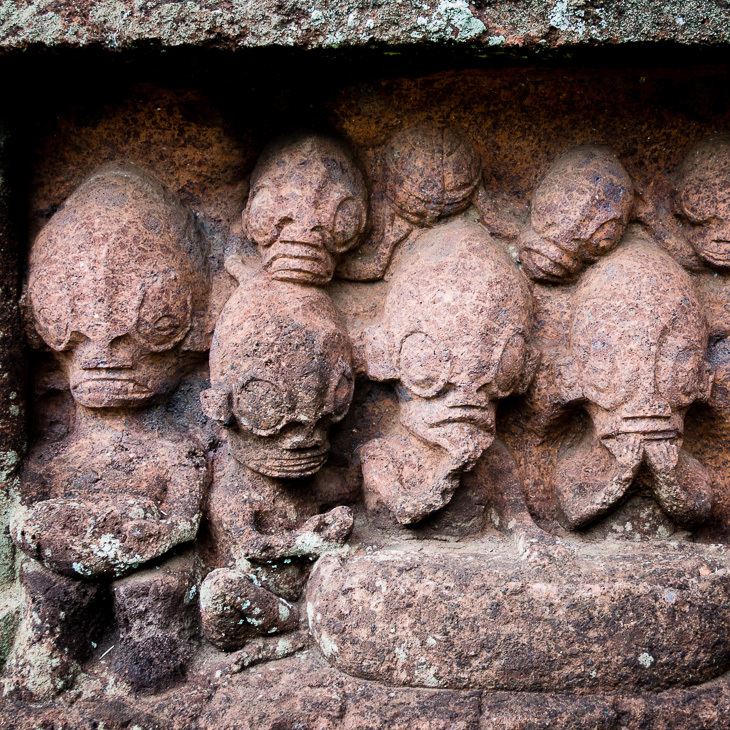 The stone and wood carvings were provided by each of the islands of the Marquesas and were clearly influenced by island culture, e.g., breadfruit is used in place of an olive tree. Across the street is Piki Vehine sacred site, a traditional meeting platform containing modern sculptures and a dozen tiki made by the island’s sculptors and by artisans from Easter Island. 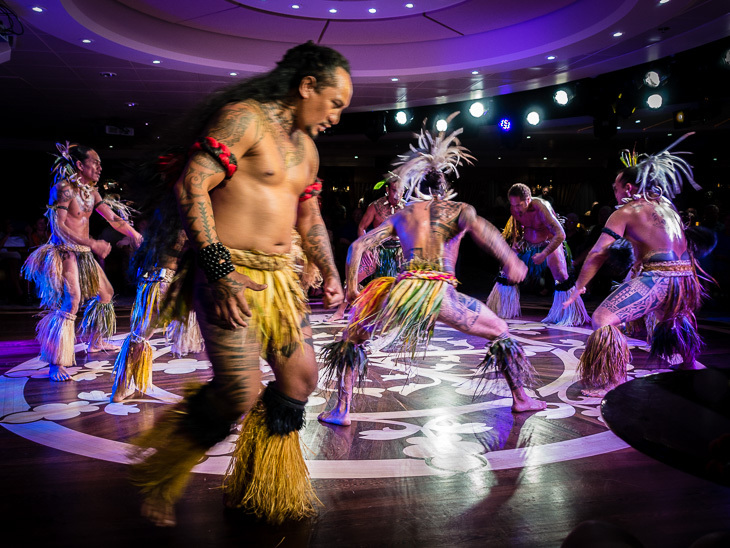 Back aboard the ship, we were treated to a performance of traditional Polynesian dances by the Nuku Hiva Dancers. Even in the air conditioned ship’s lounge, the dancers were pouring sweat. The national sport of French Polynesia is va’a or outrigger canoe racing. 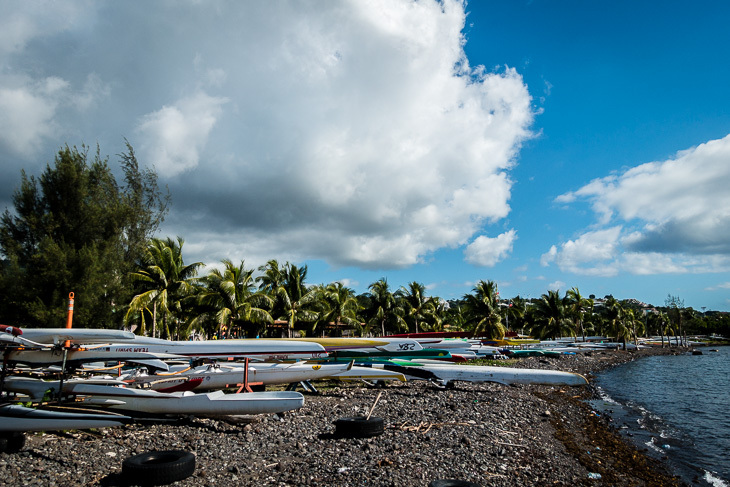 Dozens of outrigger canoes congregate on the beaches. Some outriggers are used for fishing, but most of the newer designs are used for competitive or recreational racing. 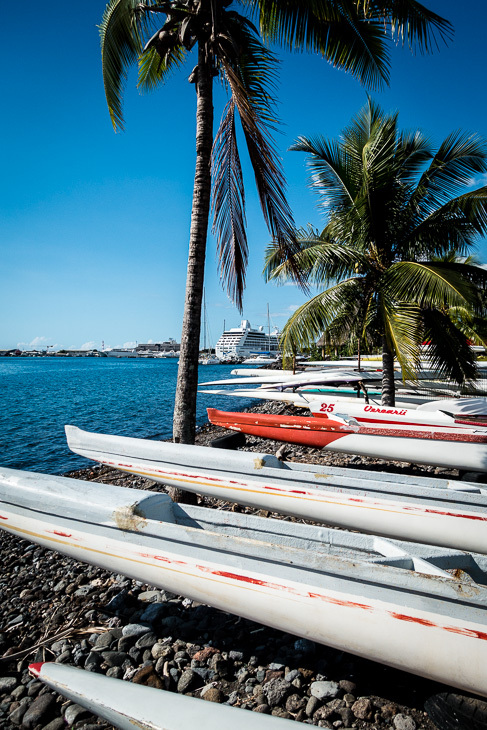 Outrigger canoes, especially the OC-1s (outrigger canoes for one paddler), are attracted to cruise ships. OC-1s love to paddle in the wake of our ship and its tenders. If you haven’t guessed by now, we love canoes. 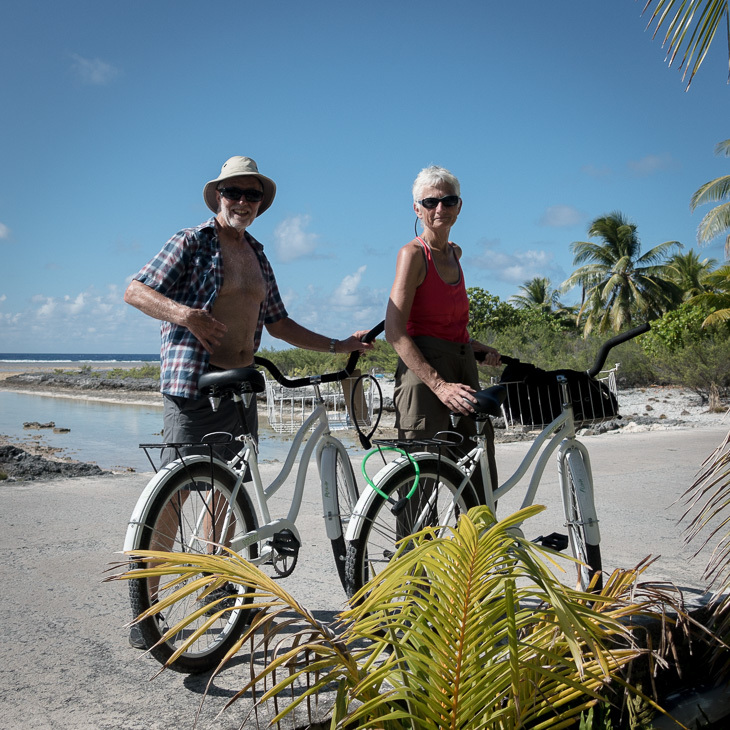 This entry was posted in Bikes, Boats, Boots, Cruise, French Polynesia, South Pacific and tagged Bora Bora, Hiking, Huahine, Moorea, Nuku Hiva, Papeete, Raiatea, Rangiroa. Bookmark the permalink. As usual, blown away by your amazing photos! All sounds a wonderful trip!